Here at AVRL we’ve held kid-lit events and writer workshops. 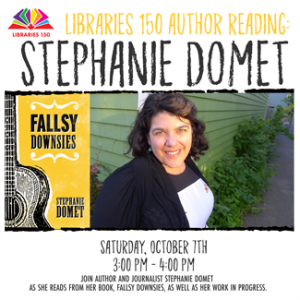 Stephanie Domet is doing writing workshops in Bridgetown and Middleton this week, and she will be back in October for a reading in Hantsport. At the end of this month, AVRL is hosting the provincial library conference at the Annapolis Basin Conference Centre, and there will be a wide range of FREE author events open to the public. Find details HERE, and register before September 22 if you plan to come, as space is limited. 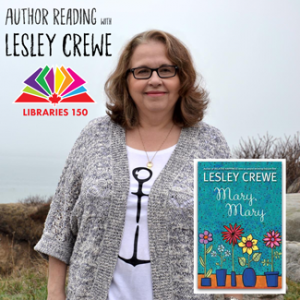 Our Kentville branch is hosting Lesley Crewe on September 26, and the One Book Nova Scotia author, Gloria Ann Wesley, will be in Wolfville on the same date. Our friends at Acadia University in Wolfville are hosting author visits. Visit their website to find out more about Authors@Acadia. These events are free and open to the public. You may want to read along with their Turtle Island Reading program as well. On Saturday, September 16, at Word on the Street in Halifax, the 150 Books of Influence will be launched. You’ll find out which books Nova Scotians say are the 150 books that best tell our unique story. Watch for the list on this website, as well. We are looking forward to seeing this list, and providing you with copies to read. So, settle in, grab a Nova Scotia book, and make sure you head to one of these great author events.